We at Cobra believe the focus of legal operations has changed. We have undergone a transformation in how legal services are delivered. The real driving force is the creation of perceived value by clients. It is no longer enough to just be the lowest price. We must deploy the right resources at the right price, aligning risk with cost. We must Value Source! The optimal mix of resources is how real value is derived. 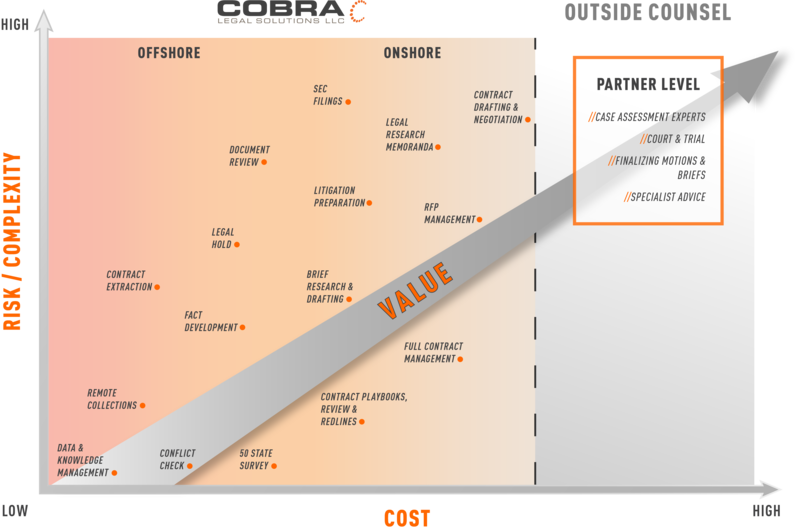 At Cobra, we deploy Value Sourcing through the Cobra System. See diagram above. Our teams of attorneys, technologists, and eDiscovery professionals assemble multi-disciplined teams utilizing a global footprint to create the Value clients demand. What tasks should be done by an ALSP? Who should manage litigation cases? In-house attorneys or outside counsel? Can lower cost resources handle in-house functions? Can they perform these duties remotely or should they be on-site? Can entire functions within a legal department be sub-contacted? Value Sourcing addresses these questions with a wholistic approach and provides the right answer for your organization based on your company's risk tolerance. We look forward to partnering with you and your company to derive the value you seek from your legal services.